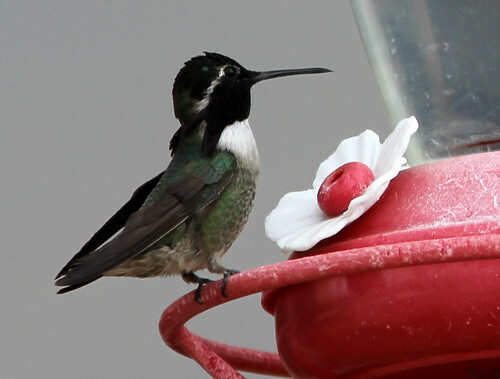 While there are a number of different hummingbird species that live in Arizona, I think I’ve finally narrowed down (with the help of a friend) the type of my primary visitors to be Costas hummingbirds. Identified by photos of the male that seems to like to visit my feeder, and then by reading up on the nesting habits of the female. The little lady that made her nest in my tree bore a clutch of two eggs. I rarely found her incubating the nest, or even the hatchlings, so imagine my surprise one night to discover a pair of tiny beaks poking out of the nest! The wee ones quickly grew, to the point where it was easy to see them in the nest. Soon they were big enough that they didn’t comfortably fit inside the nest, and were more or less on top of one another, jostling for position. 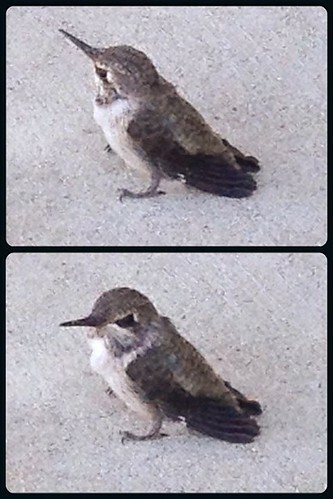 …who rather ungracefully landed in my driveway. 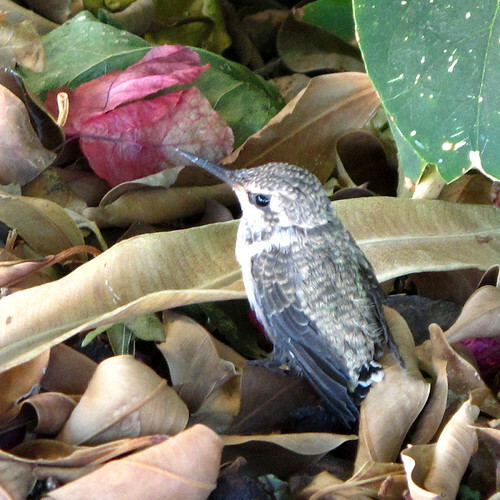 After recovering from its initial flight, the wee one lifted off again, to land in a much safer location near my bougainvillea. 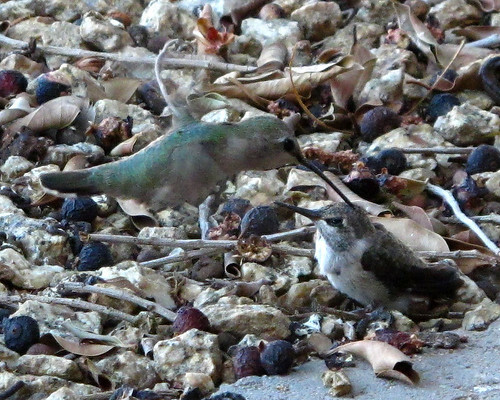 The second flight was a little haphazard – it makes me wonder how much hummingbirds use their tailfeathers as a rudder, because this wee one doesn’t seem to have developed significant tail plumage as yet (just look at those wee tailfeathers!) It was absolutely fascinating to sit back and observe the mother bird find her chick (she wasn’t present when the baby fledged). Upon returning to the nest, she definitely appeared agitated to find it empty. She seemed to fly in a circular search pattern honing in on her chick’s frantic peeps. I’d say they were reunited after about 5 minutes of searching. 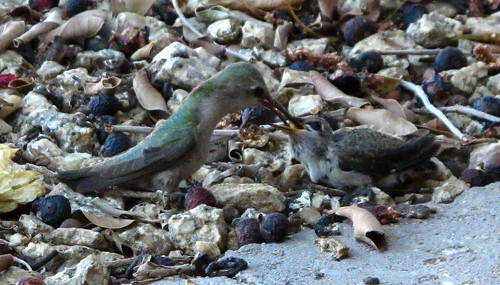 After reuniting, the wee one was rewarded with breakfast. I stayed to watch them for a while, and after some encouragement, the two of them flew off – perhaps to teach the young one how to find food. 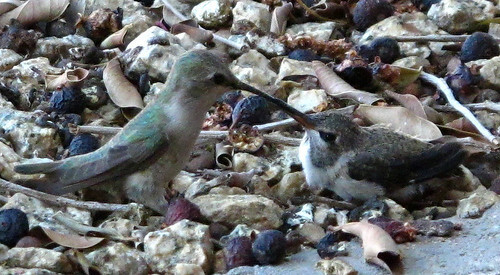 It seems mother hummingbirds will stay with the younglings for a bit, continuing to feed them for the first several days after fledging. 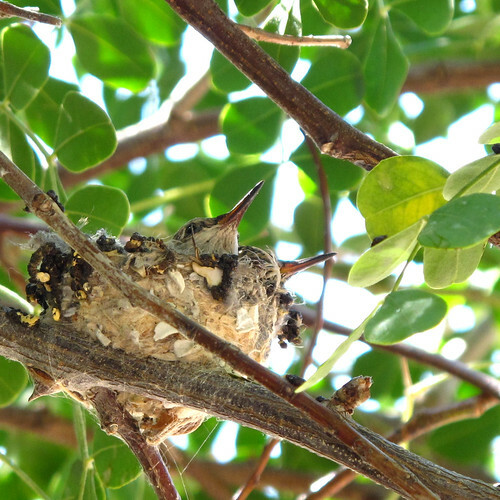 I think they have stayed relatively close to the nest, as I see the mother bird (or what I think is the mother bird) frequenting the large ficus near the tree that the nest was in. 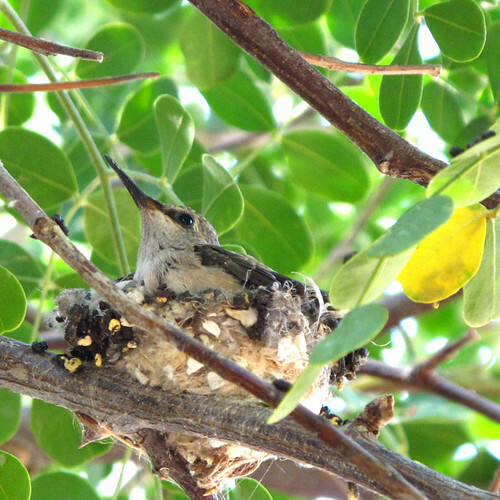 I haven’t been able to catch sight of the baby/babies – they are quite small, and the area of the ficus that I see the adult hummingbird consistently return to is the most densely leafed out portion of the tree. 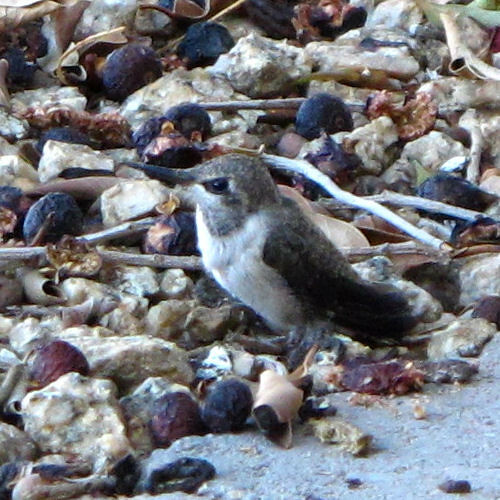 Here’s one last look at the fledgeling – here’s hoping they grow up and stay in the area! I’d love to get a chance to observe more clutches in the future! 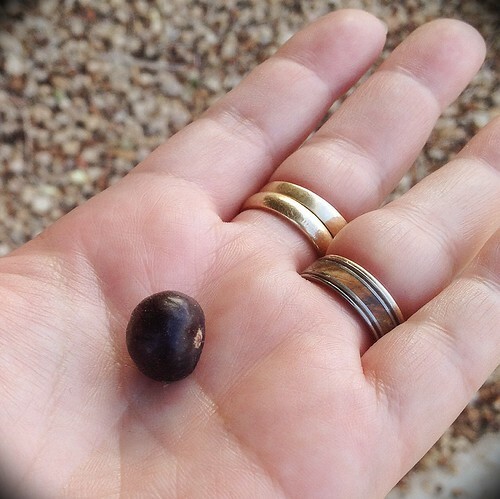 For reference, here’s a photo of a freshly picked fruit from the ficus tree – that’s what all those berry-like things are scattered on the ground. Did you know that the ficus is related to figs?? thanks 🙂 I just wish I had a better lens to capture it all with! Though it was kinda dark in the yard on account of the huge shade tree and early morning hour.